All you need to do is to sign up for an account, either via Email or Facebook. I’ve used Facebook to cut to the chase. 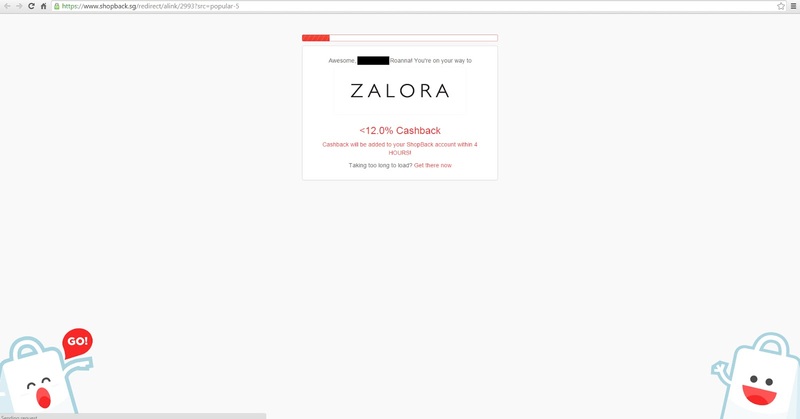 After signing up, you have your own account and you can now start shopping! 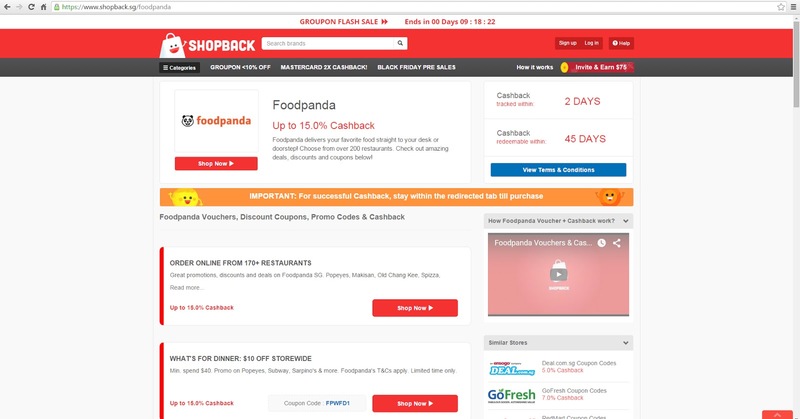 If you are hungry and looking to order in, or throwing a party, you can get Foodpanda vouchers and feast from the site too! Some of my favourite F&B outlets include Shihlin Taiwan Street Snacks, Popeye’s, 4Fingers and more! 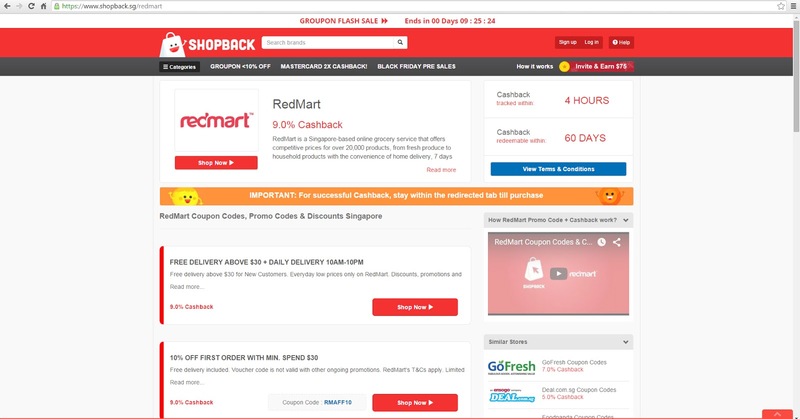 If you’re feeling lazy and don’t wish to head down to the supermarket or wet market to do some grocery shopping, RedMart is here to make life easy for you! It’s essentially a local-based online grocery service that offers competitive prices for over 20,000 products, from fresh produce to household products with the convenience of home delivery, 7 days a week in 2-hour windows! Impressive isn’t it? With ShopBack, there are RedMart coupon codes to use on your purchase too! 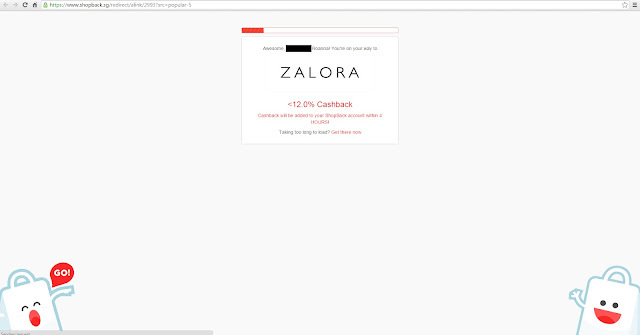 For the purpose of this review, I have decided to shop at ZALORA since I need new shoes for my sister’s upcoming wedding at the end of the year. With the crazy sales going on at the site, I thought, why not? What you have to do is to click on the “SHOP NOW” button from the ShopBack website and the page will redirect you to a holding page before the actual website loads. This is how the holding page looks like. It’s important to click on the button from the ShopBack website so that the site is able to track your purchases for the cashback to be reflected. 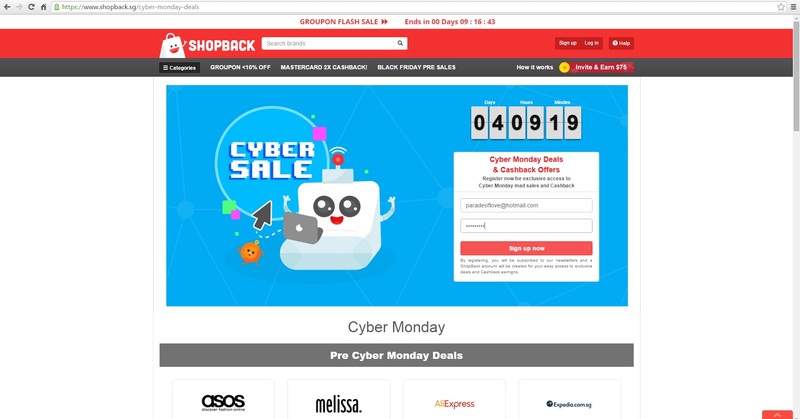 Another way you can check if your shopping is logged is to right-click on the “BACK” button to see if there is the little red shopping bag icon. Once you have made payment, ShopBack will track the amount you have paid to the merchant and a percentage of the total amount will be credited back to your ShopBack account as cashback. Within the next hour, my cashback was reflected in my account though ShopBack recommends 1-2 days before the amount gets credited. 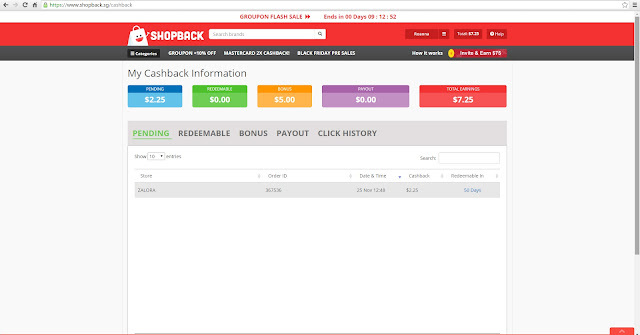 Also, if you sign up, update your particulars, visit a merchant and make a purchase via ShopBack, you’ll get a bonus of $5 credits! 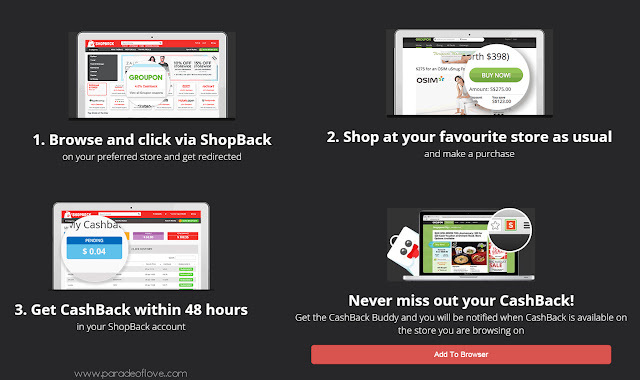 When you’ve reached a redeemable cashback of S$10, you may then cash out to your PayPal or bank account at the end of every month. Simple, isn’t it? It’s like being rewarded for shopping! 😉 Pretty sure you can’t get this anywhere, especially if you are physically shopping in stores. By the way, Black Friday and Cyber Monday sales are coming up! 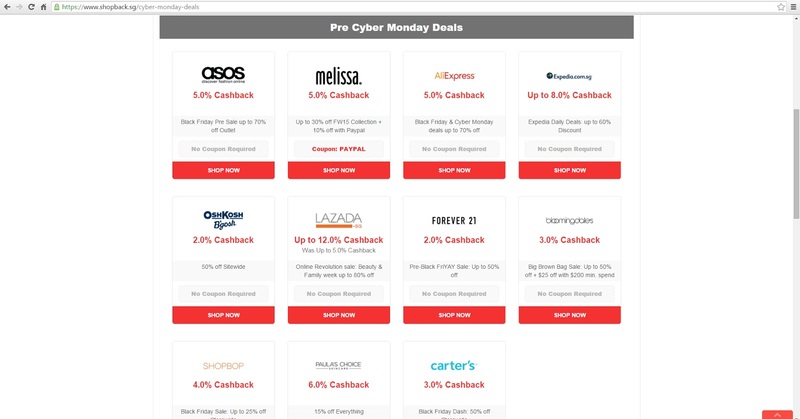 You can take advantage of those sales and pick from a wide range of brands to shop from! Since Christmas is around the corner, do some festive shopping for your family and friends (and yourself :P) and earn some cashback in the meantime! 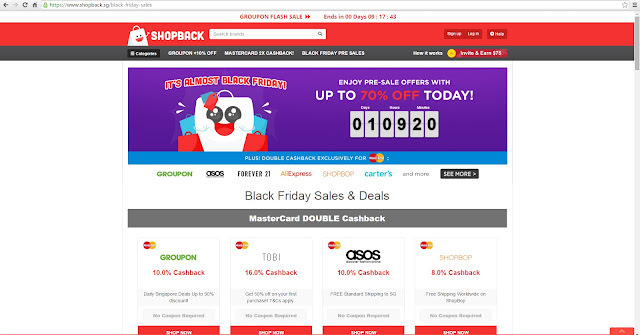 For Black Friday, if you use MasterCard on selected merchants, you can get a DOUBLE cashback. So, what are you waiting for? 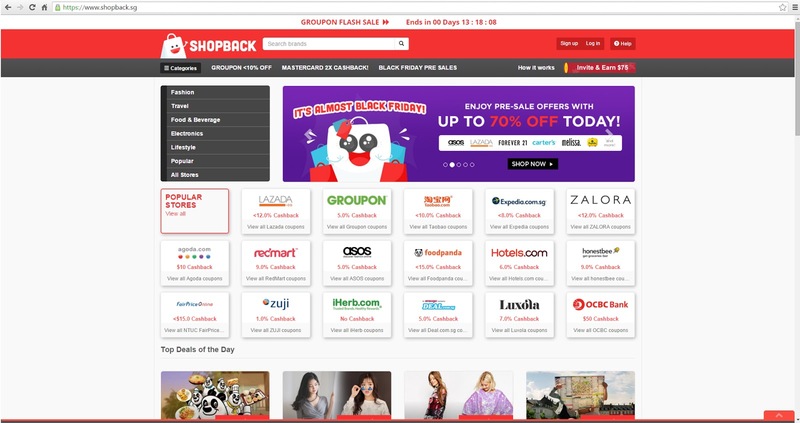 Shop and get the latest deals with ShopBack now! Disclaimer: The above review is based on my true and honest opinion without influence from others. It contains information from the brand.